Merry Christmas. Hope you are having a wonderful day. I have another HUGS update to share. This canvas has been a fun exercise in color opportunities. It can be tailored to your specific color likes or needs. 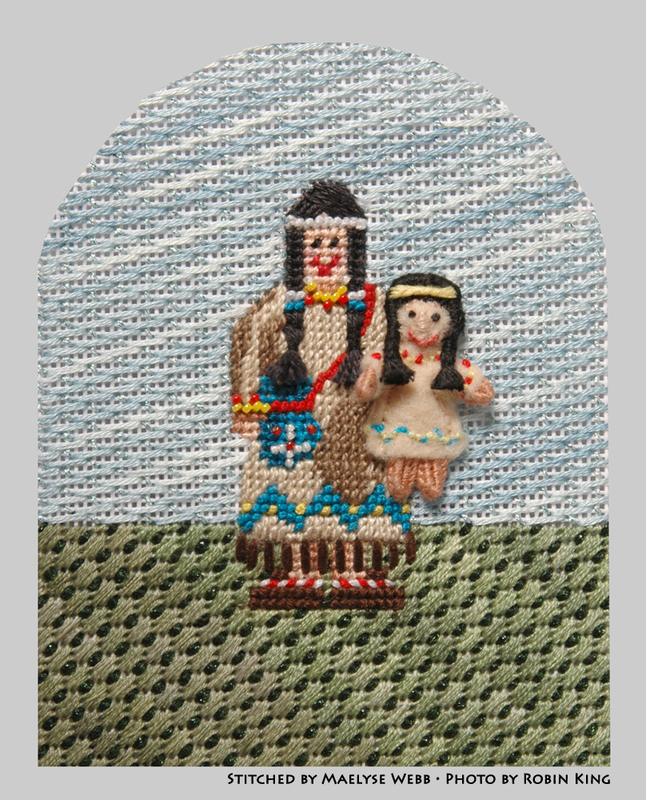 "I am thinking that this would be a great canvas to stitch for a child going away to college. A little reminder on the bed or chair that Momma and Daddy send hugs. You could do school colors or dorm design colors, etc. Any way you look at it, it looks great." As you might remember, I selected the Gloriana Silk Thread (Laura's Garden #084) for my color way. From there, I wanted an accent color for the Border and behind the H.
In the computer, I played around with color options. 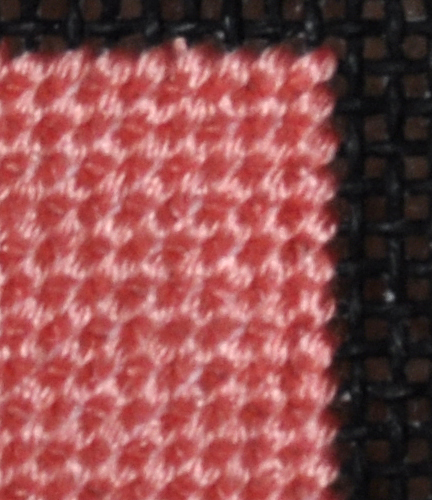 Here is the same canvas with different color accents: first purple, then coral. 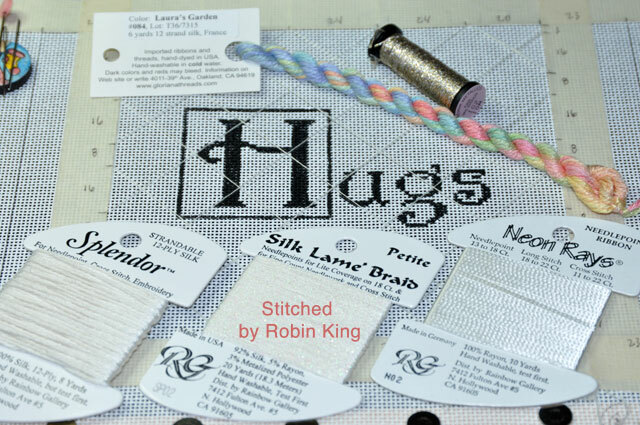 It's easy to pull colors from the overdyed thread. Each color way sets the mood. See how it might look with different color ways? 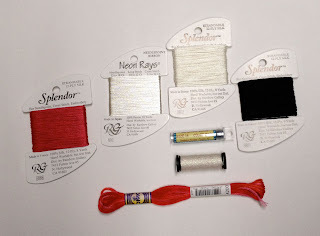 All you will need is an overdyed color, a neutral color, an accent color, black color, beads, Kreinik size 8 braid, and Neon Rays. Imagine the possibilities. The HUGS canvas will come with my stitch guide... 11 pages. 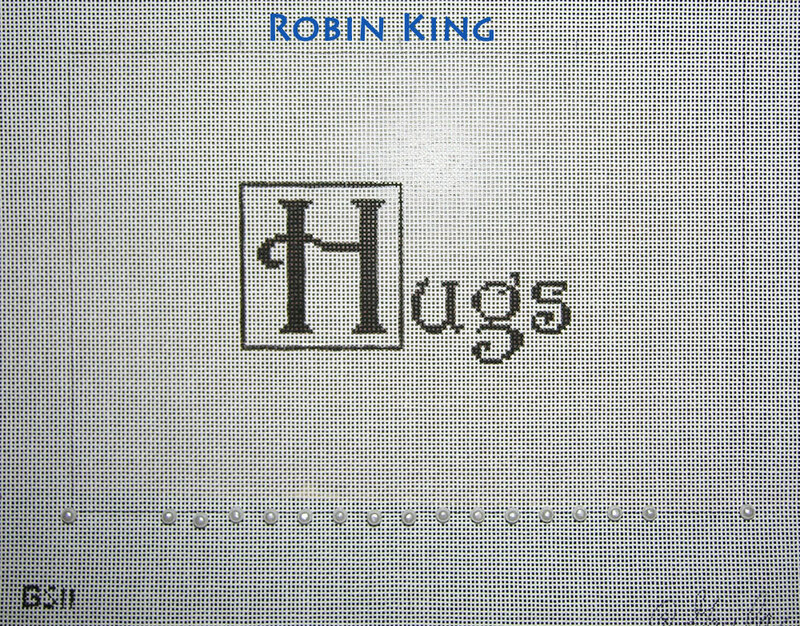 The HUGS canvas is finished and is now in the wonderful hands of Elizabeth Turner Collection for their finishing magic. The pillow will be delivered to me in Phoenix at the beginning of the Market. 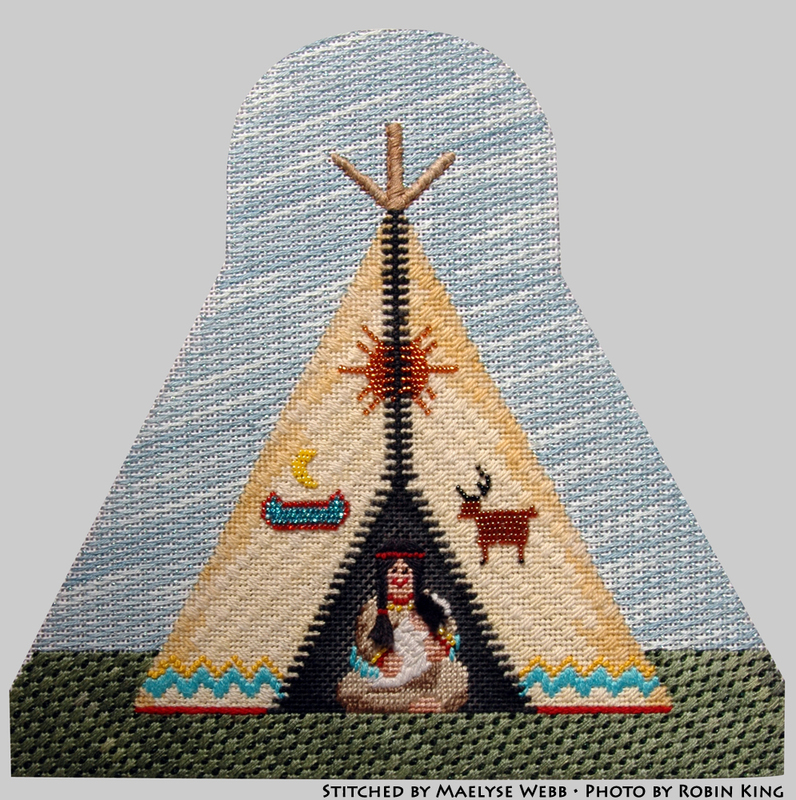 It will be on display at the Alice Peterson Company booth. Did you catch that bit of news... I'm going to Phoenix! I'm teaching!!! 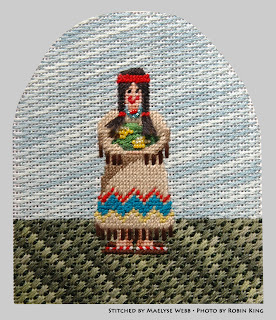 for DMC: their Friday afternoon class (2PM-4PM) 3D Cake Embellishment (FT210) featuring DMC Memory Thread techniques. I am so honored they would think of me. The canvas is a new design from Associated Talents: CD1200. Treated myself to a little gift. Presents for everyone; nothing for me. Sound familiar? Here is a little something I saw today and bought for myself. Thought I'd share it with you. Stitchers Inc. has these great project bags. Love their open mesh and colorful zipper. They have a nice attached fabric panel, too. 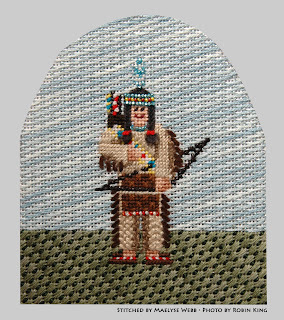 Jan is the owner of Stitchers Inc. located in Memphis, TN. 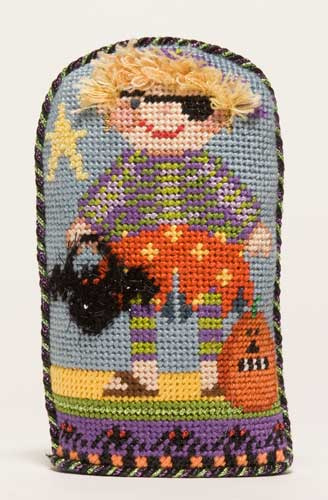 She has an assortment of bags with seasonal fabrics, too. Give her a call; she can get them right out to you. 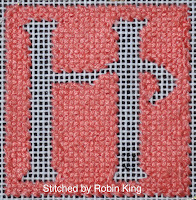 These bags measure approximately 16" W x 11" H.
Labels: project bags, Robin King, Stitchers Inc. 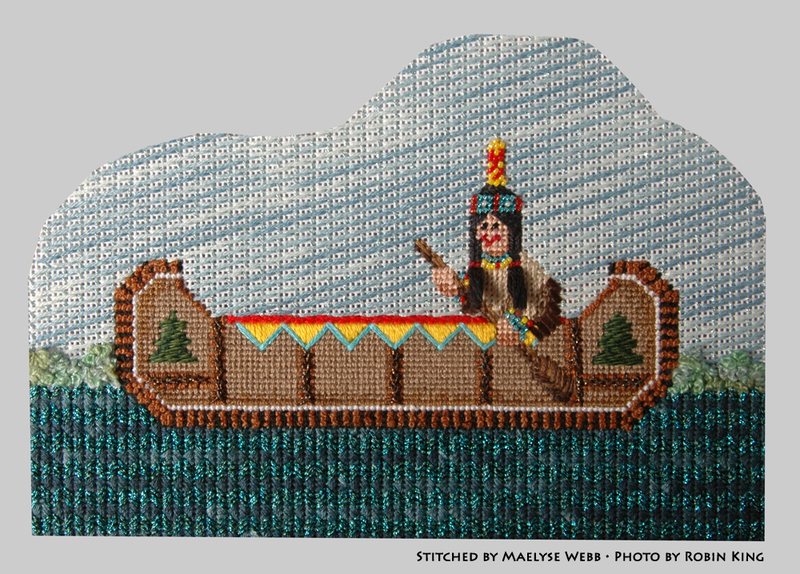 Sometimes a little Basketweave is just what a needlepoint piece needs. A place to rest your eyes, if you will. 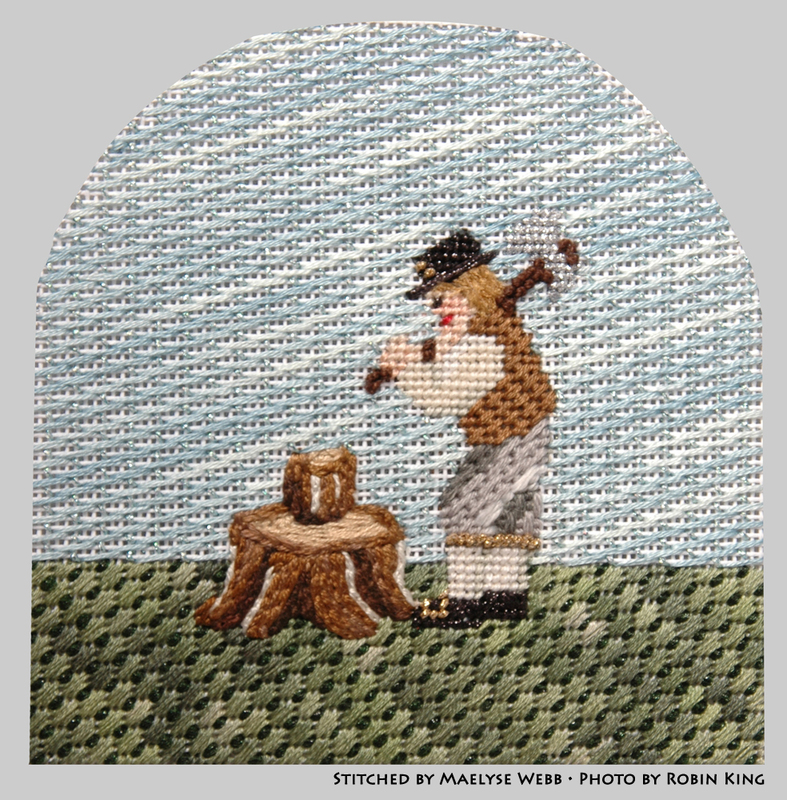 It's the cornerstone of our stitching repertoire, and yet, we might overlook using it because we are in love with all those other decorative stitches. 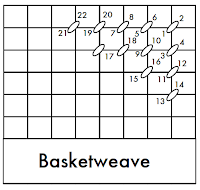 In the 1970's, I learned how to do the Basketweave stitch from reading a charted diagram. 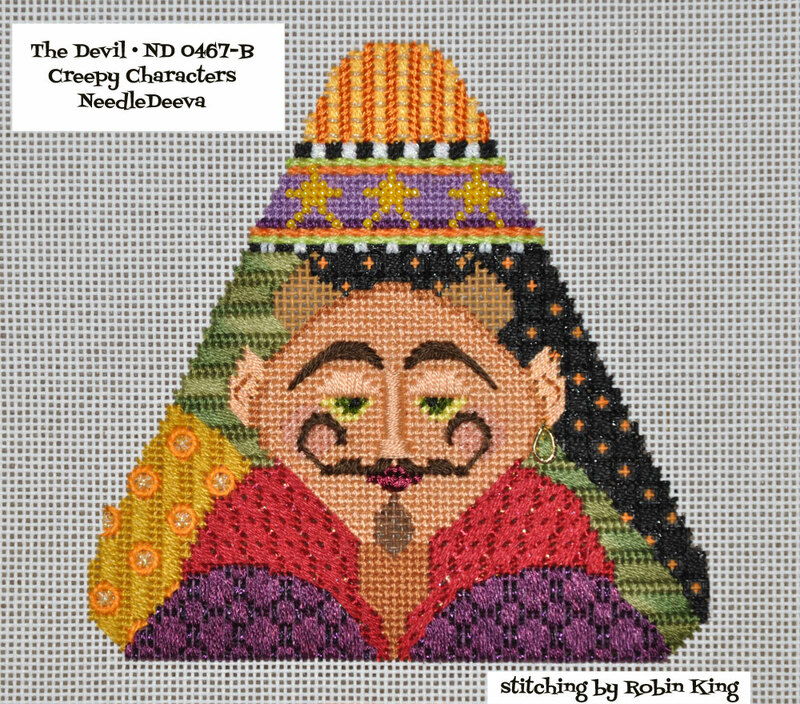 (True confessions: I began as a self-taught stitcher.) I understood it had a diagonal pathway. Only recently did I realize there was more to that stitch... much more to learn... to do it correctly. 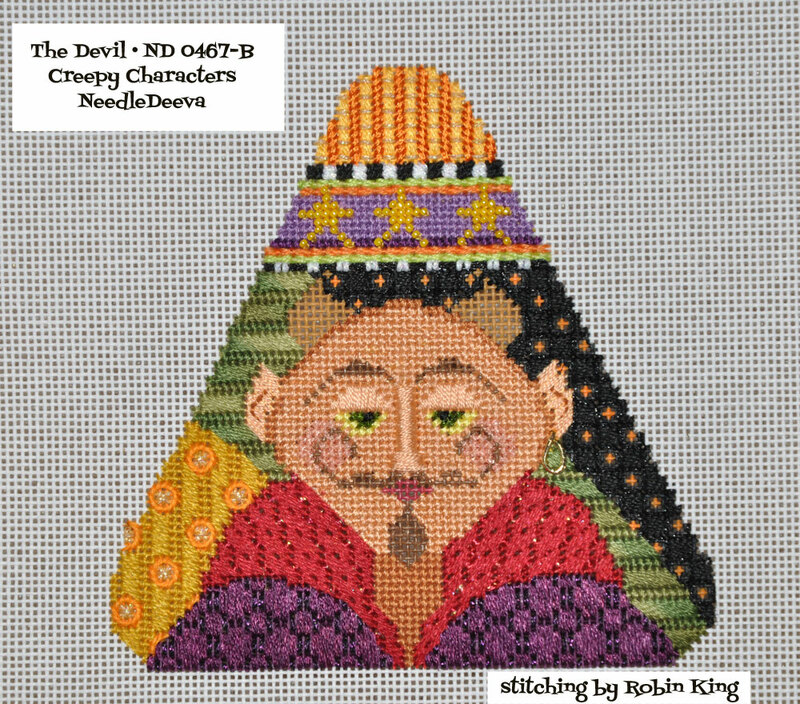 Last year I was photographing Vicky De Angelis' stitched models for NeedleDeeva. 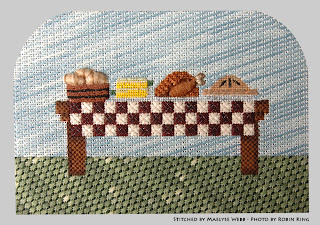 Getting close to her work through the camera and computer, I noticed her beautiful Basketweave stitches. being at the beginning of Robin's learning curve. 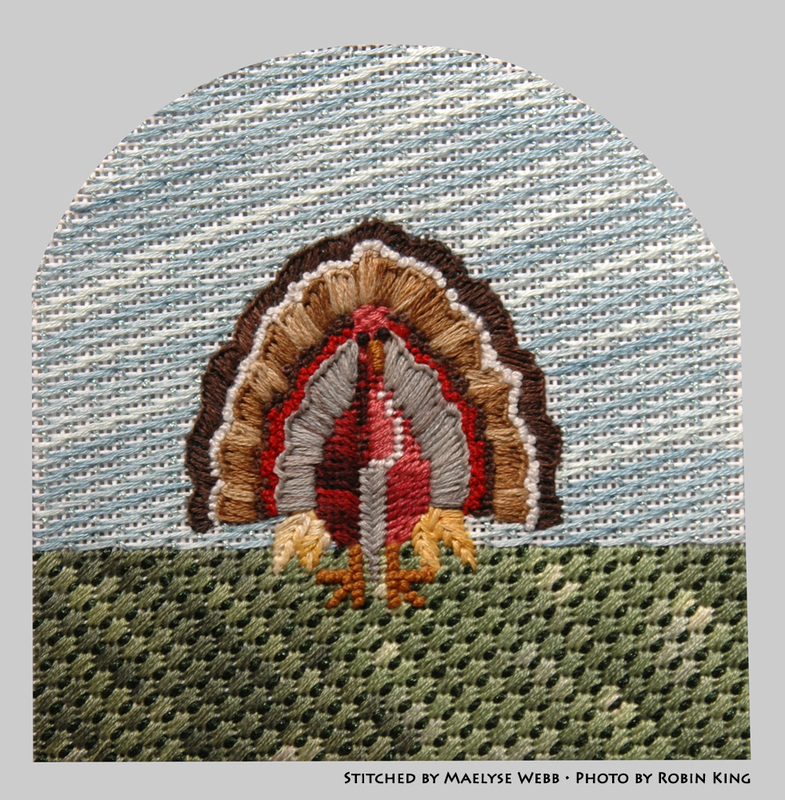 Then, I looked at my stitching. At the time, I was stitching The Devil (ND 0467-B) from the Creepy Characters. 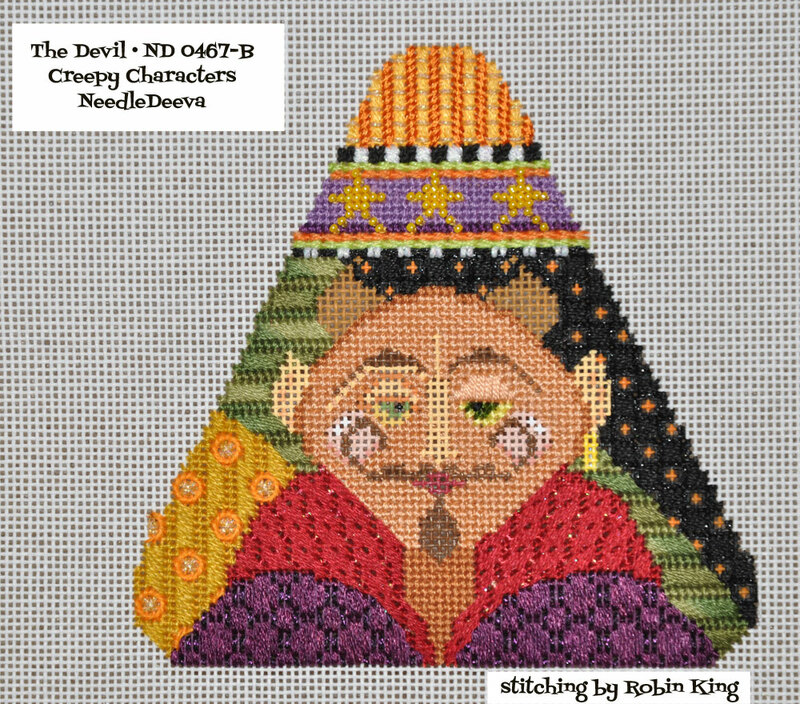 Quite a different look for the same stitch. I was keeping the diagonal pathway; what else could I do to improve my technique? I had remembered the saying, "Walk up the Steps... Slide down the Poles." 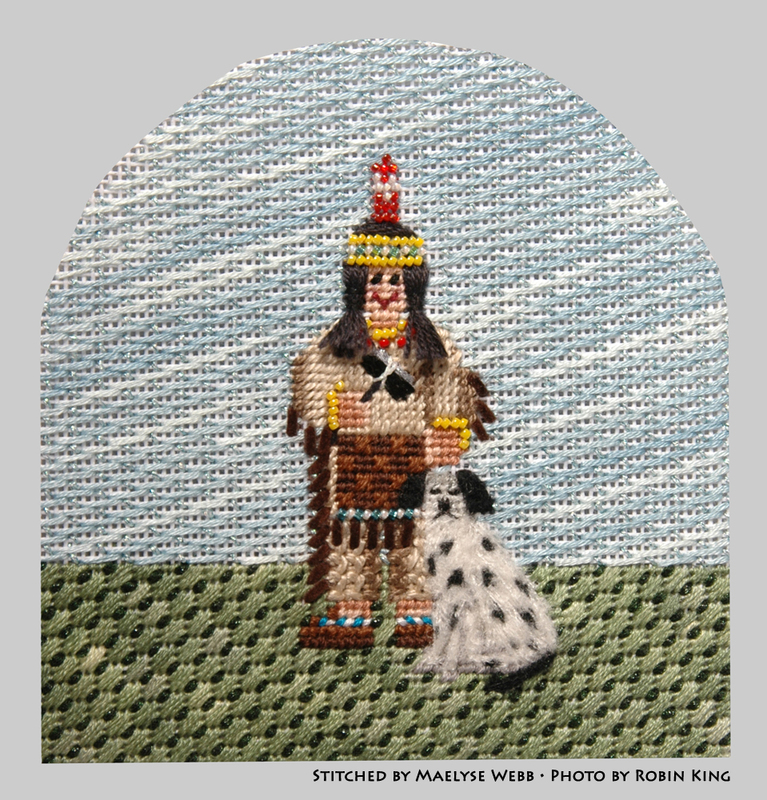 In my early stitching days, I heard it, and yet, couldn't/wouldn't process it. 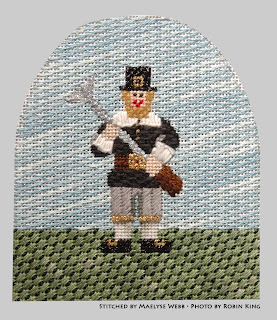 I never took time to study the canvas threads: the warp and the weft threads. There was a wonderful charted diagram in The NeedleWorks March 2011 e-newsletter which gave me my "ah-ha" moment. The horizontal steps and the vertical poles were pointed out to me; cue the celestial choir. At the same time, I remembered Amy Bunger taught a 2-hour class about Basketweave at TNNA. 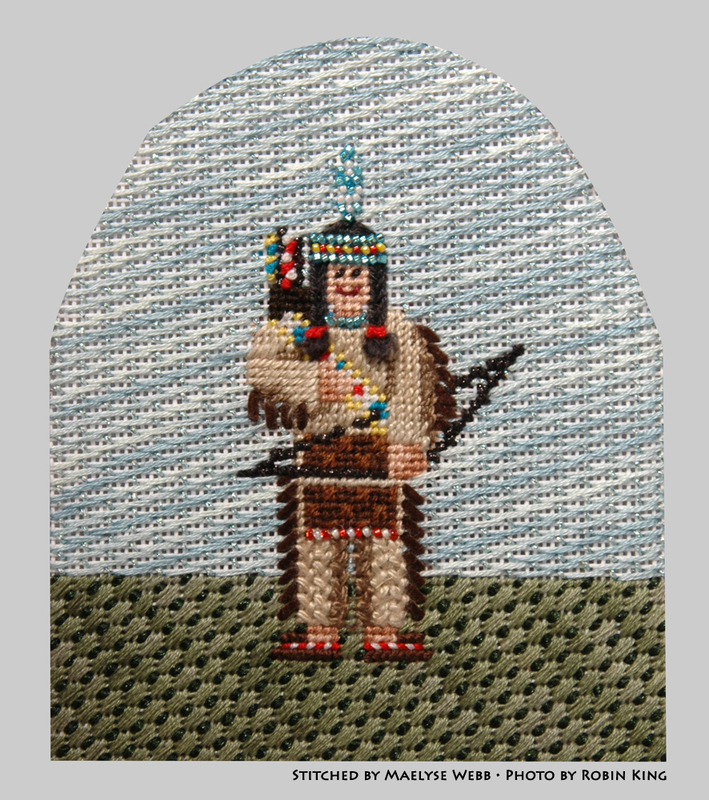 Imagine that... 2 hours on the Basketweave stitch. 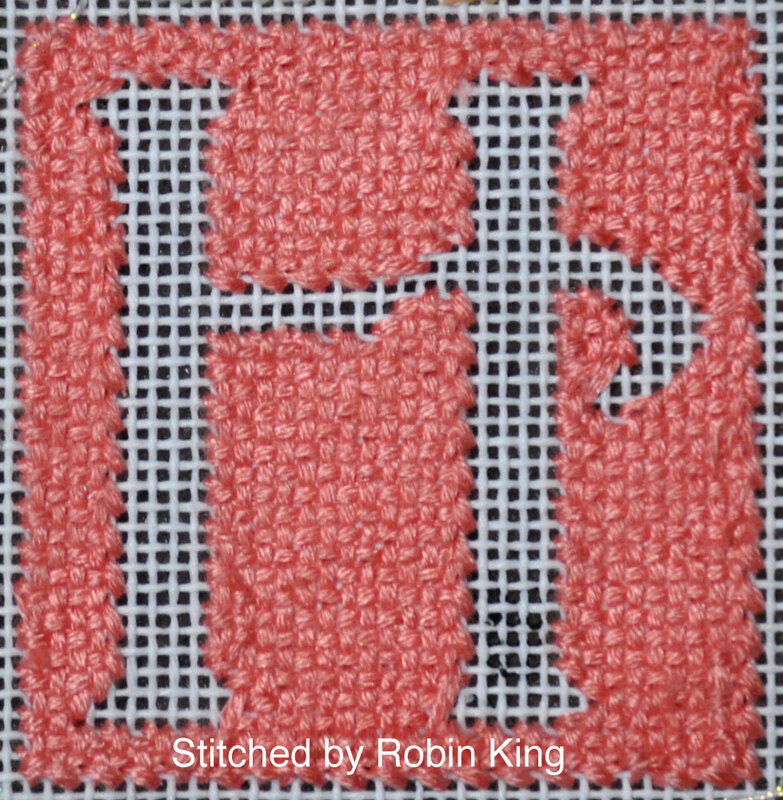 Currently, I am editing the Tony Minieri DVDs, Back to Basics • Level One, and again, the Basketweave stitch was discussed in depth. Pay attention to the canvas threads: walk up the Steps and slide down the Poles. It really does matter. 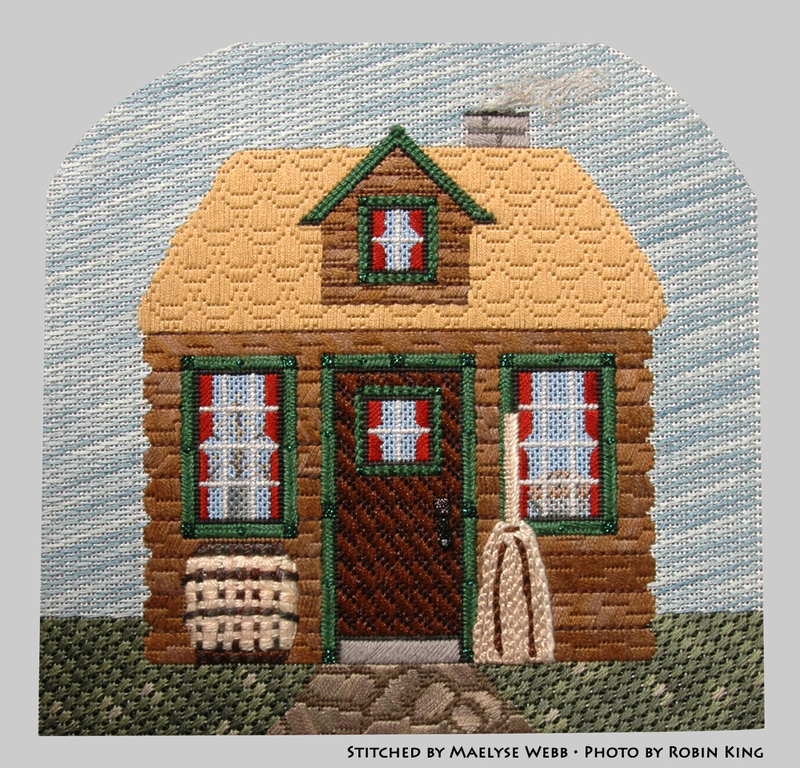 When beginning a new thread, pay attention to your last stitch and begin the next stitch in the correct sequence. If your begin at the other end, you will get a "striped" look. When ending the thread, do not run it back into the worked area. 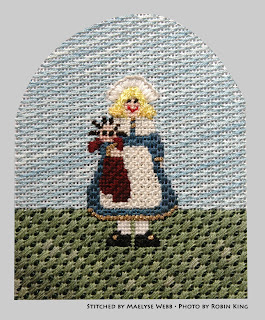 You will get a "hole" in the stitching. 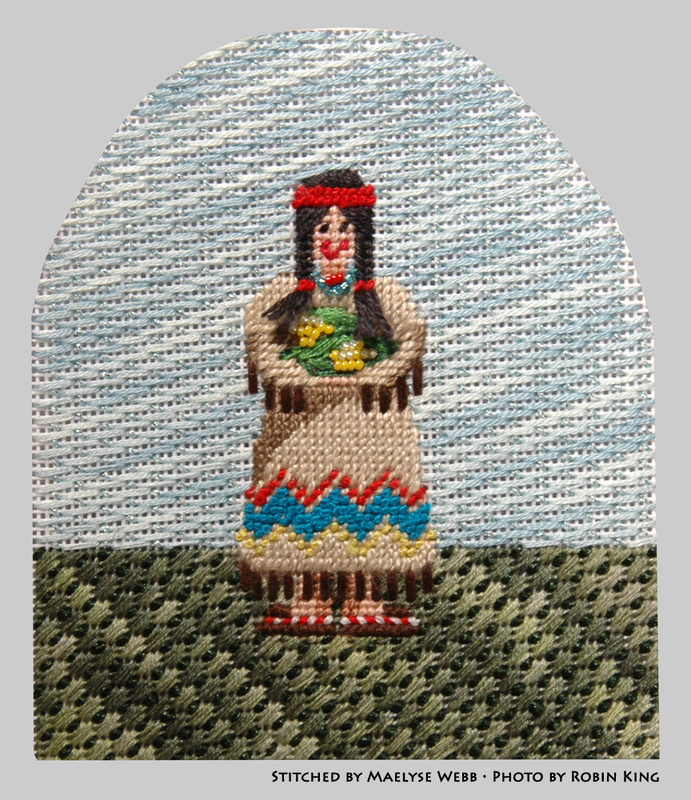 Instead, pull your thread forward so the new thread will have coverage on the backside. 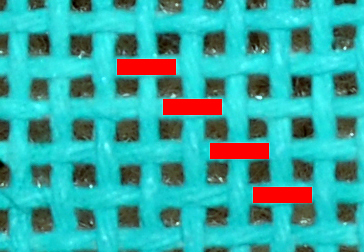 To end the thread, run it either horizontal or vertical along a few stitches; never diagonally. 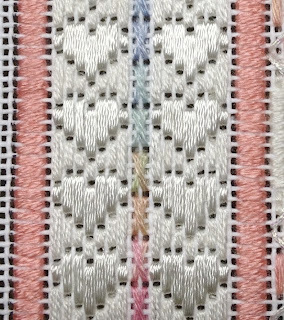 I am now proud to show you my backside of the Basketweave on the HUGS canvas. 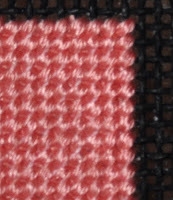 I can honestly say this is the first time I correctly did the Basketweave stitch. I am so thrilled. Hopefully, my learned lessons will help someone, too. 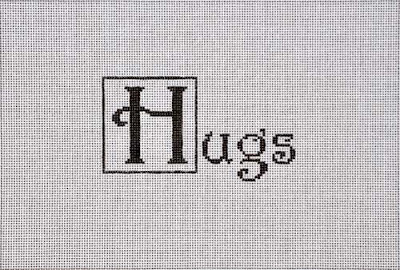 I have a quick preview of the HUGS border to share with you. 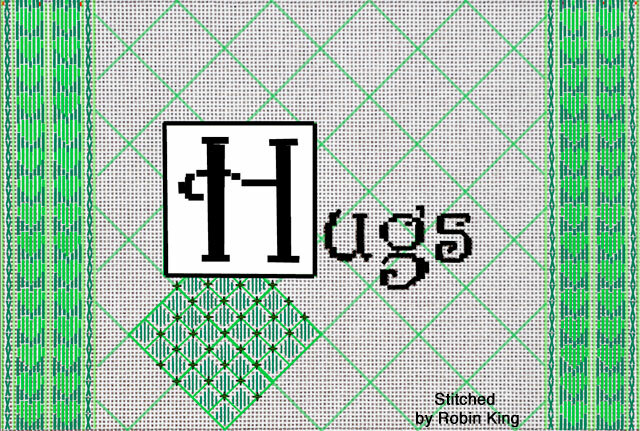 The Heart Border helps to set the tone of the Hugs message, don't you think? My stitch guide will come with each HUGS canvas (GS-11); available from Alice Peterson Company next month. Your LNS can order this Gayla Elliott canvas at the Phoenix TNNA market. My original color scheme for the HUGS canvas was cream, tone-on-tone, with Kreinik 102 for a metallic accent. It looked pretty while I was auditioning stitches... elegant and safe... all at the same time. 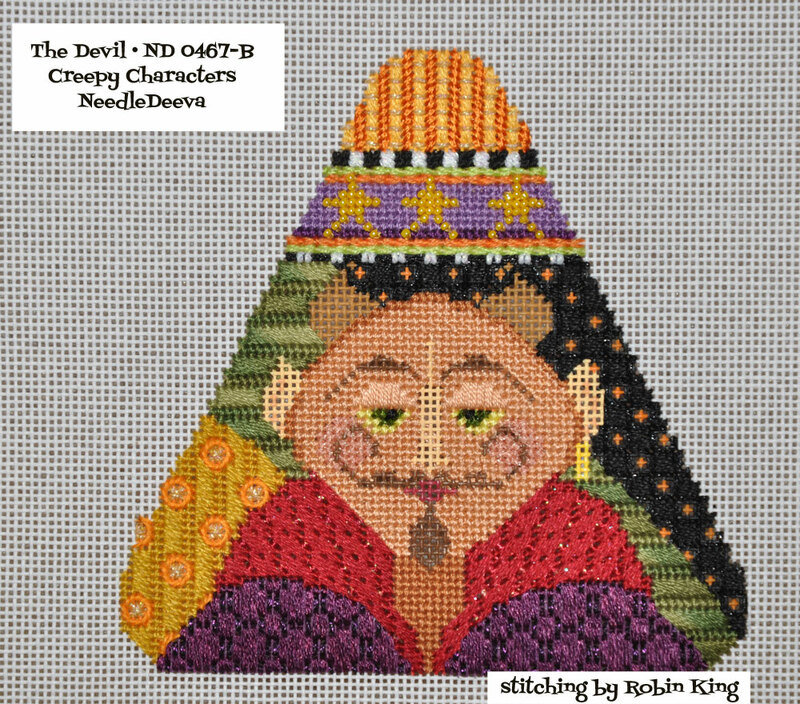 Then I started to think about you... the stitcher... the customer... the student and not just... me. What if one didn't like a tone-on-tone idea? Could one see beyond the cream for wonderful color opportunitites? Would the cream tone-on-tone get this canvas design overlooked? 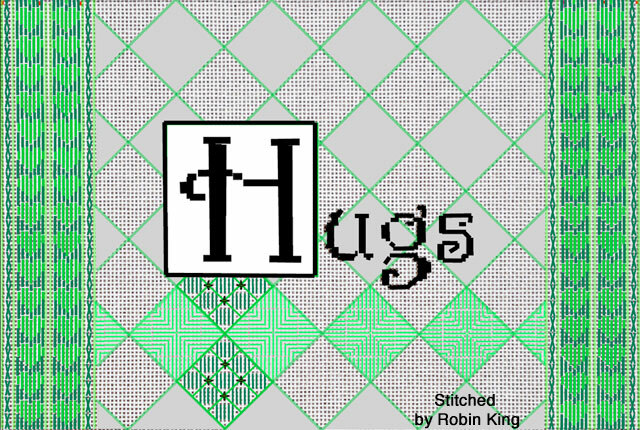 So I decided to bring in some other color options for the HUGS canvas. 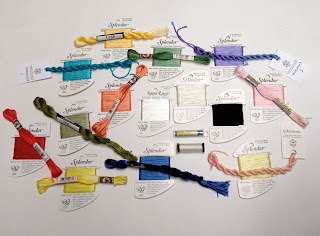 When I think of wonderful colors, I think of hand-dyed and over-dyed threads. Gloriana, ThreadworX, DMC, Sampler Threads, Weeks Dye Works, and Caron Collection are just some to spark your interest. I studied all of the colors and began to pull those which spoke to me. Again, the beauty of this canvas is that you can pull colors which speak to you! 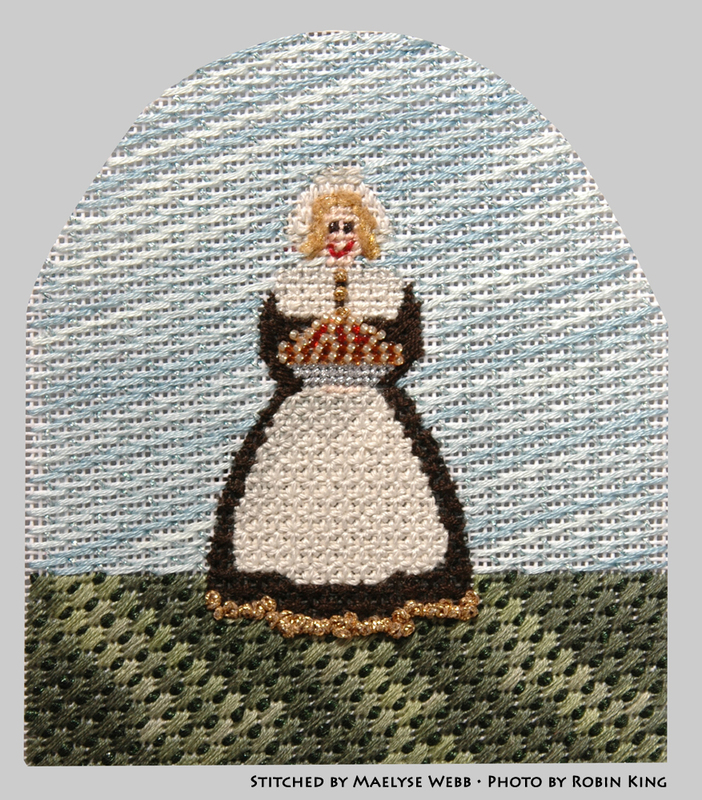 Here are some examples from the Gloriana Threads website. 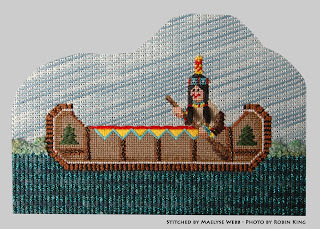 Anne Frazier makes the prettiest color-ways. Check them out at your next opportunity. Then, I picked a solid color. I did keep the cream going by selecting Splendor S802. 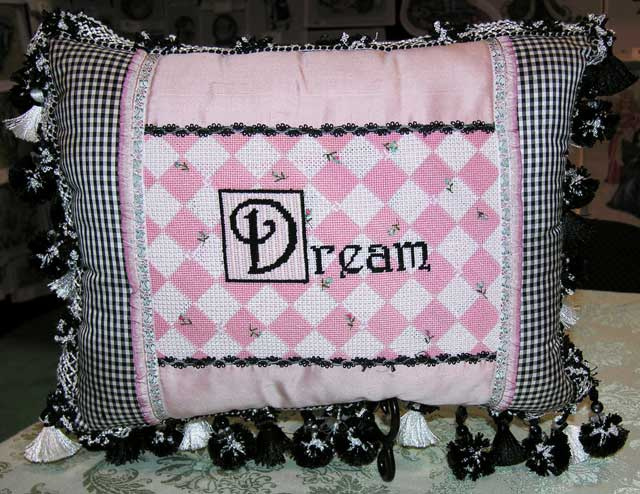 Remember, I was still smitten with the Dream pillow's pink & white diamonds. I didn't want to exactly copy it, but I sure was inspired by it. Oh, one note from some previous comments: the schematic diagrams were done in green because I needed a color for "illustration" purposes; when I was doing the charting, I was still in a cream, tone-on-tone mode... which would be hard to read on the computer. But, if green makes you happy... then go for it. 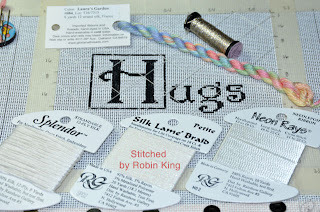 My hand-dyed thread choice was Laura's Garden (#084) from Gloriana Threads. The flowing colors are so beautiful. They made me happy. I also saw some other solid color opportunities to introduce, if needed. So here is what I chose: a hand-dyed thread, a solid thread, a metallic thread, a sparkly thread and a Neon Rays. Like I said... the color combinations are endless. I can't wait to show you how it is looking. 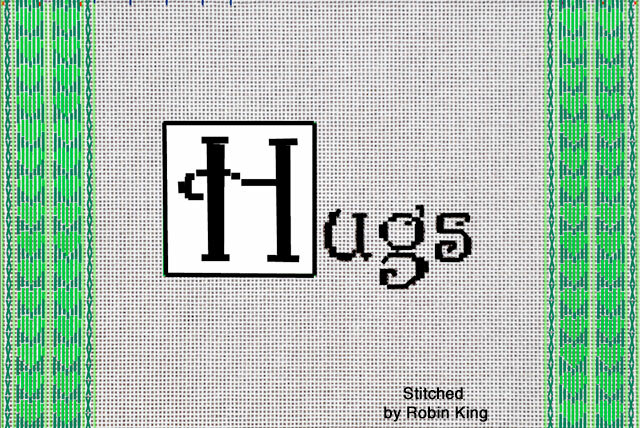 Let's continue with my HUGS progress. I have a lot to share with you. When last we spoke, I mentioned I had a design concept in my head and was going to try it out on the computer. Actually, my mind was spinning with the blank canvas possibilities. 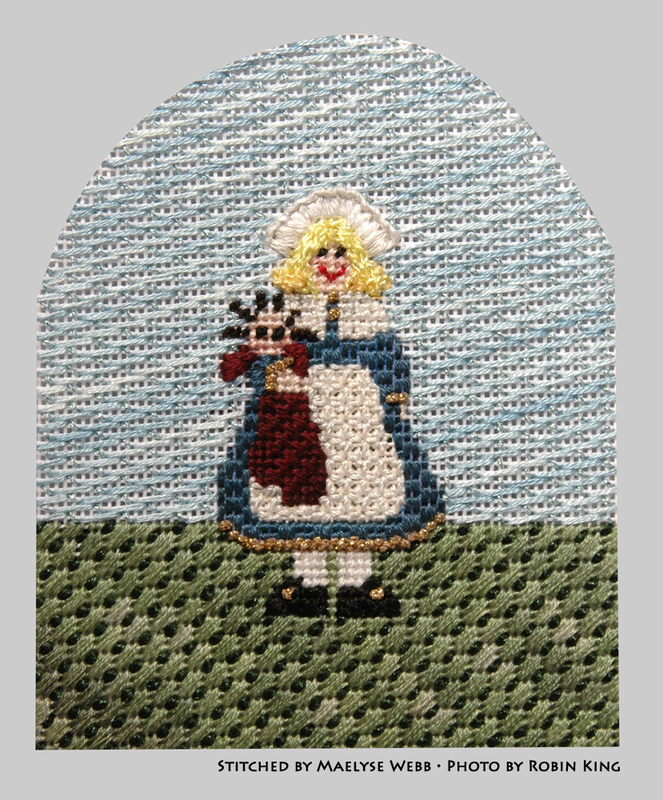 I needed to see them and confirm them before I could stitched them. I studied my books from Amy Bunger, Brenda Hart, Suzanne Howren & Beth Robertson, SuZy Murphy, Ruth Schmuff, and Julia Snyder, and finally decided to go with inspiration from my Jean Taggart books. I never met Jean Taggart but hold her in highest regards from stories told to me by Amy Bunger and Tony Minieri. I have two of her books, Laid Fillings for evenweave fabrics and Darning Patterns for evenweave fabrics, and refer to them often. 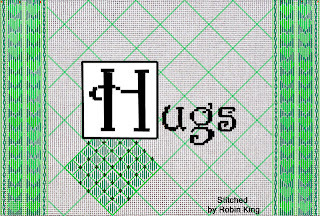 Since my original intention for this HUGS canvas was to showcase a Laid Filling pattern, going with Jean Taggart just made sense. 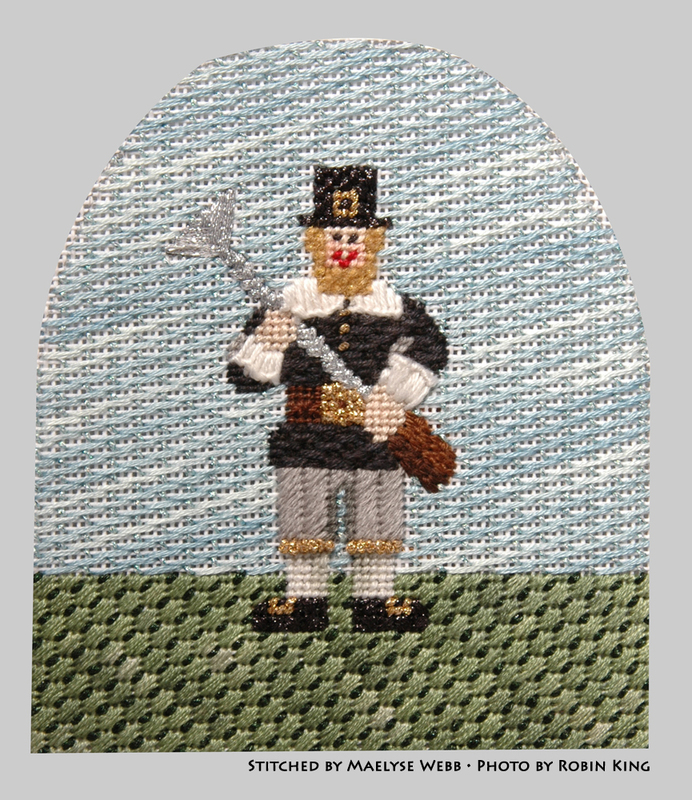 First, I came up with the border. 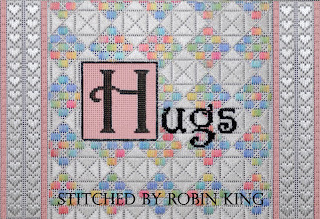 It's a Hearts border; after all, we are talking about hugs! I was wanting something which "showed the love." It looks like a brocade ribbon, don't you think? 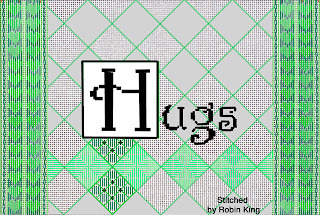 I feel it will have many uses beyond this HUGS canvas. Then I needed to deal with the center area. I was still smitten with the diamond pattern on the Dream Pillow; I wanted a diamond pattern, too. I wanted a Laid Filling "diamond" pattern... also known as a Diagonal Trellis filling pattern. I counted the number of threads between the border to find the center point. 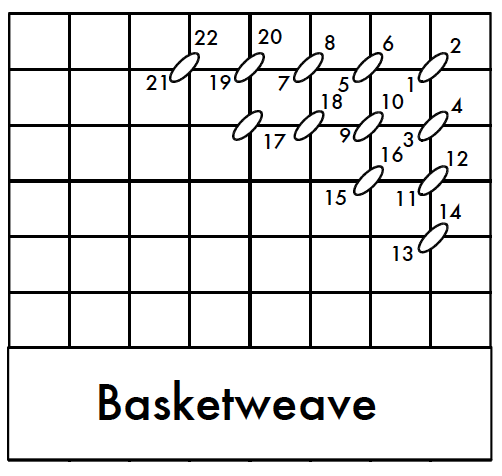 Then, I laid out a grid in the computer. I was seeing so many possibilities for this canvas. Should I work the entire center area in the Laid Filling or should I break it up by adding alternating solid color diamonds? Again, it was easy to figure it out in the computer. 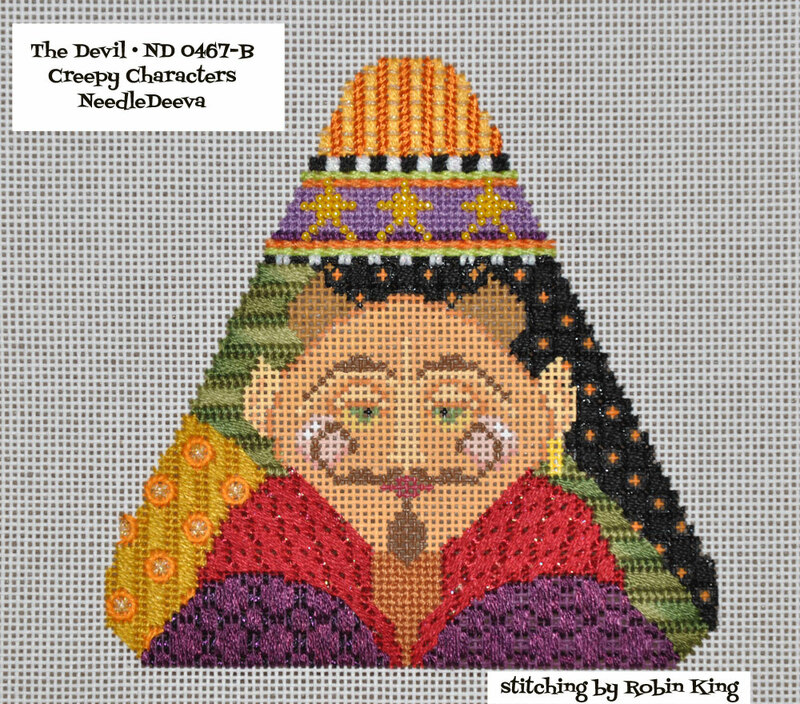 I am going to give different scenarios in my stitch guide. I'll share more with you the next time. Which colors to use? Which threads to use? Again... the possibilities are endless. Hope everyone had a nice Thanksgiving. Sorry to be so quiet. I've been busy stitching under the Cone of Silence. Some wonderful opportunities are coming my way. I can't share them with you at this moment, but I will as soon as the Cone of Silence is lifted. 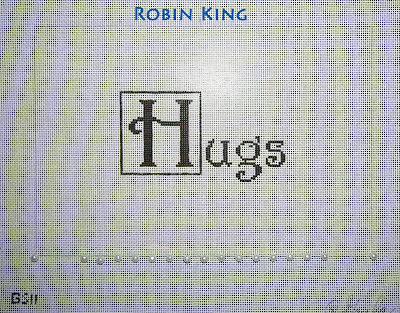 Right now, I can show you the beginning progress of the HUGS canvas. Remember, I first spoke about it on September 5, 2011. 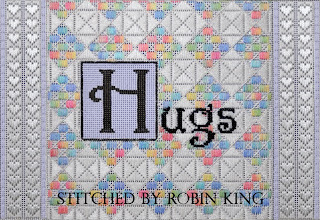 Here's the link: HUGS from Robin. 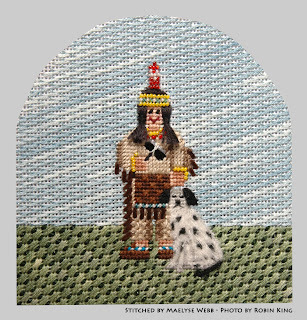 It is a sayings canvas from Gayla Elliott, a needlepoint canvas designer represented by the Alice Peterson Company. Quite a pedigree, don't you think. Designing for the HUGS canvas can be daunting... after all... it is a blank canvas. 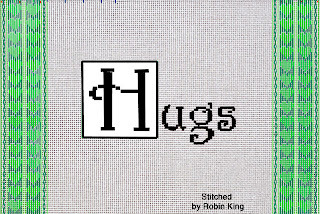 However, designing for the HUGS canvas has wonderful endless possibilities, too... because it is a blank canvas. I had first seen the Gayla Elliott sayings during TNNA. Her Dream canvas and model were on display in the Alice Peterson Company booth. 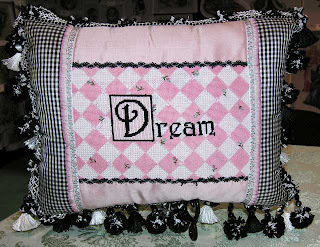 It was lovely because of the diamond design and the pink & white colors. I was smitten. 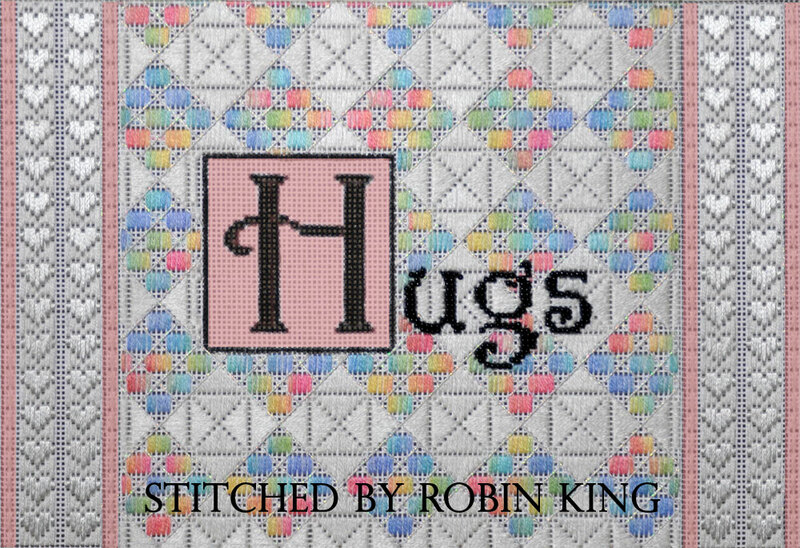 The HUGS ideas began swirling in my mind. I wanted to design my own diamond pattern; one which would lend itself to the white unpainted canvas. I also wanted to work in a Laid Foundation pattern. I thought both would play nice with the Square H design. I wanted a Border, too. Yes, Santa... I wanted it all. I sketched some ideas on graph paper and then worked the rest of the details in the computer. I will share more photos with you. 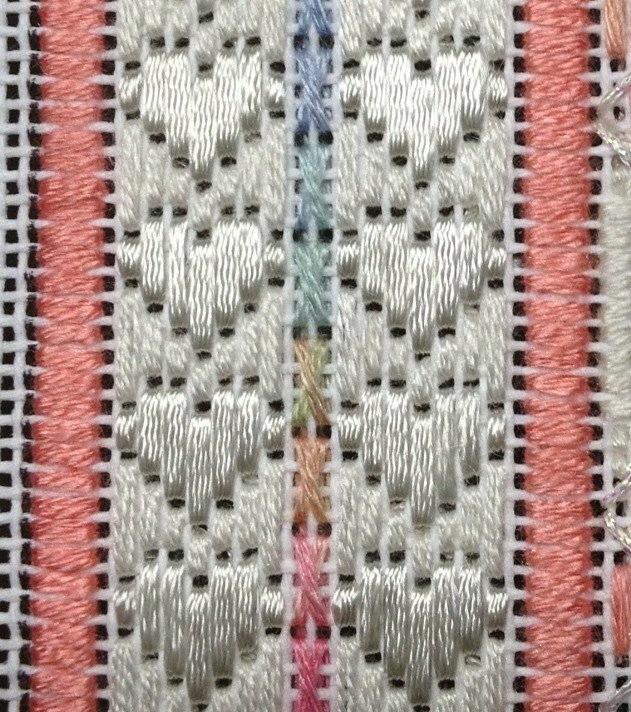 Here is one of my first photos: counting the threads. 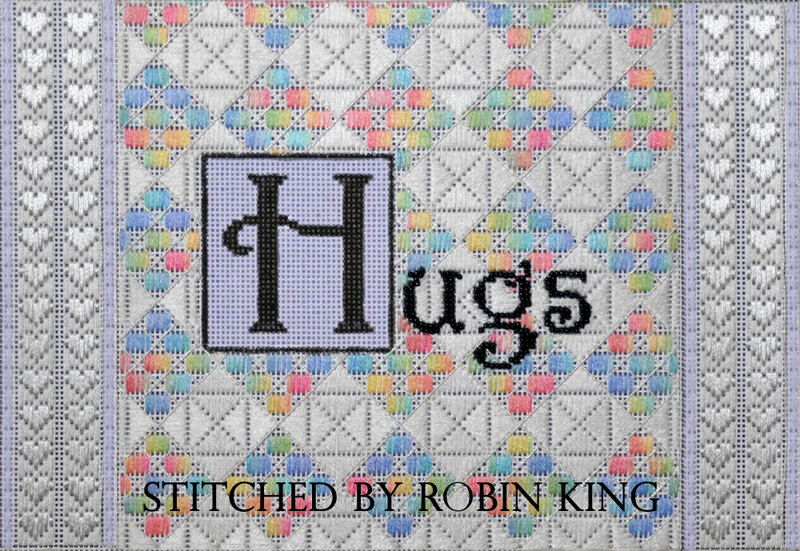 I will be writing the guide and each HUGS canvas will come with my stitch guide. Again, I want to thank Gayla Elliott for this creative opportunity. HUGS would also make for a nice teaching opportunity. Like I said, it has endless possibilities. Thanksgiving Day is near and I have some photos to share with you. 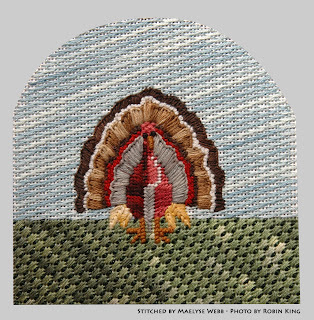 In 2008, Maelyse Webb (Memphis, TN) attended my Saturday Canvas Enhancement classes with the goal of stitching the Thanksgiving Village by Rebecca Wood Designs. 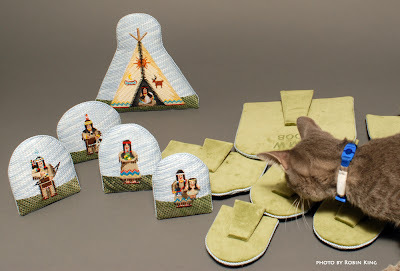 We planned out the first canvas which then inspired the next canvas... eventually all 13 pieces were stitched. Maelyse did an awesome job. She had each one finished with easel backs... what a lovely effect. Maelyse enjoys them every year. Glad I could share them with you. Here's an extra photo. At the time, Tiger was our newest photographer's assistant. He still hadn't learned how to approach the set without disturbing the models. It's a lesson everyone has to learn; however, what a great way to show the easel backs and monogram! Good Tiger. Ever wonder how I stitch a face? I found my work-in-progress photos of The Devil (ND 0467-B) from the Creepy Characters series, and thought I would share them with you. Now, what is that saying?... the Devil is in the details? LOL. Enjoy the show. I think he is quite the handsome guy. NeedleDeeva did an awesome job designing this cutie for the Creepy Characters series. 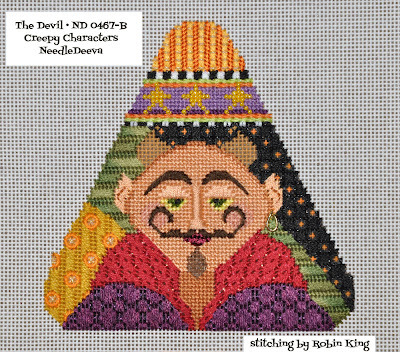 Contact your LNS if you'd like to stitch him. You can see the participating retailers on the NeedleDeeva website. 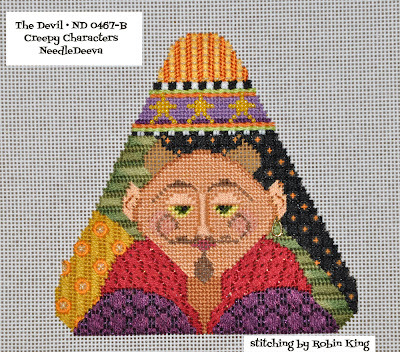 The Devil canvas (ND 0467-B) comes with my stitch guide, too.